Lenovo probably did Windows 8 the best of anyone so far with the bendy, twisty Yoga. Now it's got the Thinkpad Tablet 2 and keyboard combo. If the Lenovo Yoga is a laptop that's sort of a tablet, this is the tablet that's sort of a laptop. An Intel Atom-based, 10.1-inch Windows 8 Pro convertible tablet. People who are primarily looking for a tablet, but who want to be able to switch to a laptop-style form factor and run real Windows programs in a real desktop environment every now and then. 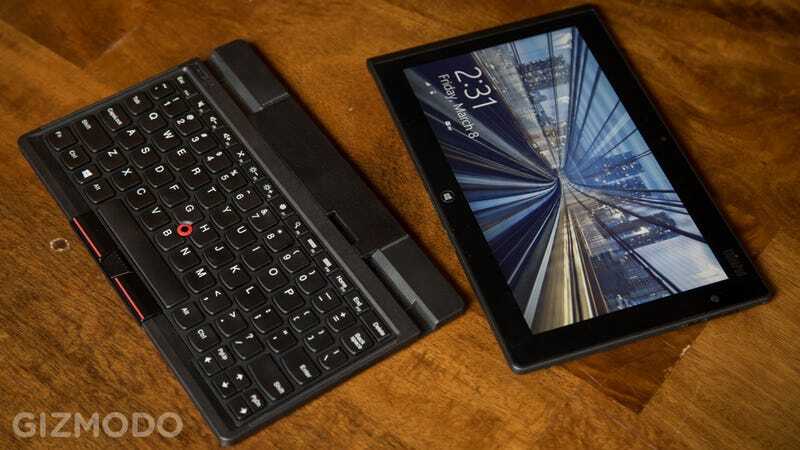 The Lenovo Thinkpad Tablet 2 looks unremarkable; not ugly, but not sleek. It's a lot like a Thinkpad. The tablet itself is angular, with squarish edges, except for a rounded right side where it holds a stylus. Its back is covered with a soft-touch matte finish that's just begging for greasy fingerprints, and at just over a pound, it has an average tablet heft to it. It doesn't feel cheap, but it does feel cheaper than $700, which is what the tablet alone goes for. In Windows 8's "Modern UI"/Metro tablet interface, the Thinkpad Tab 2 is snappy and crisp. Scrolling back and forth looks great, and it can handle apps from web browsing to mobile games like Angry Birds to Twitter apps just fine, like any good tablet should. The battery power's great, pushing a good seven hours of steady use. The 1366x768, 155 PPI multitouch IPS display—the mandatory Atom Clover Trail resolution—doesn't pop the same way a Nexus 10's or an iPad's retina display does, but there's nothing aggressively lacking about it. But it's more than a tablet, it's a full Windows 8 machine! A real laptop, right? Well not quite. Because of Windows 8 Pro, it can technically run any Windows app out there, but a lot of times the performance isn't great. The tab's Atom processor can handle word processing and spreadsheet-ing just fine, so you can do some real work on it, but anything more resource intensive will start to take its toll. You can run Photoshop in a pinch, but it's not very smooth. Likewise, an excess of 10 or so Internet Explorer tabs can be a little rough. Chrome gets lag-tastic at about five. Things will generally keep working; it just gets stuttery. Heavy multi-tasking is best avoided. The keys on its accompanying bluetooth keyboard have a shallow yet satisfying click-depth, and the construction is solid, well built. Instead of having a standard trackpad, the keyboard has a little 90s-style nub-mouse with a tiny optical sensor on tip of it. It doesn't take up much space, but it's super jumpy, so it's hard to be accurate. You're likely to wind up over-shooting your marks. The keyboard is pretty heavy; slightly heavier than the tablet itself, but that's standard. Great battery life. We squeezed seven and a half hours out of this guy during our battery test which involves 20 browser tabs and a 10-hour Nyan Cat videos. That's enough to last you on a flight from coast to coast, and almost all the way through a full work day. The Atom processor. While you have it to thank for that killer battery life, it also holds the Thinkpad Tablet 2 from more intense, laptop-y performance. That's fine for some folks, but for most of us, the Atom's still got a long way to go. The keyboard tablet pairing is really strange. The keyboard has a little spring-loaded slider, and depending on how long you hold it over, a green light will either blink or pulse. It's not immediately clear what either of those means, but if you just poke at it a few times, it usually starts up and pairs quickly. It's just not totally intuitive what's going on. While the Thinkpad Tab 2 has pretty killer battery life, it also takes ages to charge from its microUSB port (the only charging option). From an empty battery, you're looking at 9 or 10 hours. The optional stylus is an absolute life-saver if you're trying to fumble around the desktop without a real pointing device attached. It's a bit small though, and tough to hold with the same fat fingers that are bad at hitting tiny 'X'es. Likewise, its tiny "right-click" button towards the tip is easy to lose track of. The tab can actually run some really old games games—like the original Half-Life or CounterStrike—pretty well, but anything more modern is a lost cause. It will actually buck-up and run things like Portal 2 or TF2, even at full resolution if you ask it to. But the framerate is outright unplayable. Then again, that shouldn't be a huge surprise. The USB port is great for mice and keyboards and other peripherals, but it's a bit under-powered, so you'll be hard-pressed to use it for more taxing things like optical drives or portable hard drives that don't have their own power sources. Probably not. Unless you're some kind of weird edge-case, chances are you already have a laptop. Yeah, maybe it's an old one, but if it's still functioning, chances are it's at least as competent as the Thinkpad Tablet is in the Windows 8 desktop. So at that point you're just buying a tablet, and the iPad or the Nexus 10 are more cost-effective, with better touch-centric app libraries. It's not that the Thinkpad Tablet 2 is bad, it's just duplicating the functionality of something you likely already own, and it isn't any better at it. If you don't have a beater laptop, or really want a tablet that can word-process, then it might not be a bad buy. Or if your PC-only needs are really specifically non-taxing. The version we tested (with a keyboard and Windows 8 Pro) is $850, so it sits at a decent middle ground between the Surface RT and the Surface Pro, and most of the way to a really nice ultrabook. Just know you're buying a tablet with a middling laptop impression, not the other way around.